Within five minutes of leaving the neutralised zone, there is total chaos at the back of the race. Many riders are already off the back of the bunch, battling on in ones and twos, their day over before it’s even begun. A few are wrestling with their rain capes, paying the price for getting their clothing decision wrong. 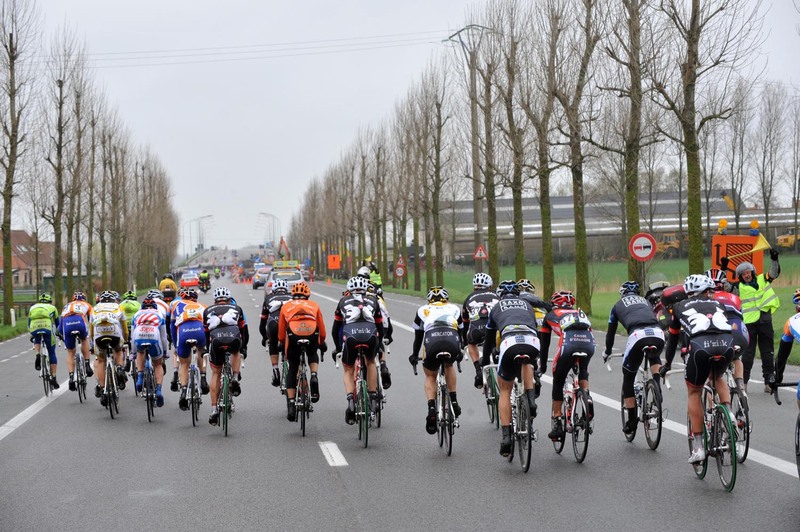 Up ahead, the pressure is on at the front of the peloton, and those who have lost contact so early, like the Bouygues Telecom rider alongside us, who is breathing heavily, hands on the drops in full race position, are already out of contention for this year’s Ghent-Wevelgem. I look out of the rear window and there are two or three riders close to the bumper, taking some shelter before moving out into the wind again and hoping to move up enough to regain the back of the bunch. We’re only just out of Deinze’s suburbs, the pre-race commentator’s words still echoing in our ears but the race is already a battle for survival back here. Pained expressions and panic. It’s a real eye-opener. This is the part of bike racing you don’t see on television. I’m in the Columbia-Highroad team car, squeezed into the back seat behind the driver, Brian Holm, wedged in among the expensive carbon-fibre wheels and lunch bags. Erik Zabel is in the front passenger seat, to my right is Nick, the mechanic. The laughter and light-hearted atmosphere of a few moments ago has given way to one of serious-minded concentration. They’re at work now. This is their office. The radio cracks and hisses, but it is not the feedback that sparks Holm into life, but news of a puncture for the team leader, Mark Cavendish. Holm accelerates, moves out into the left-hand side of the road, passes the other team cars, honks his horn at the riders who are spread in desperation across the road, weaves between them. It’s an impressive manoeuvre, particularly when you realise he’s driving with one hand on the steering wheel, the other on the radio handset. A voice comes over the radio. An indistinguishable buzz of feedback, the wind blowing a gale into the microphone, nothing more than a noise, but Holm understands from it that Mark Renshaw is with Cavendish, donating his wheel. We see two figures on the right-hand side of the road, their yellow, white and black Columbia jersey instantly recognisable. Much as you want to criticise its lack of sartorial charm, there’s no denying it stands out now, when it needs to. The wind is howling, the rain is spitting. Before we’ve even slowed to walking pace, Nick has the rear door open and is out, with wheels in hand. The change is swift and Nick pushes Cavendish on his way, then replaces Renshaw’s wheel and gives him a running shove. Back in the car, Holm accelerates, pausing only to let Renshaw get a little shelter on the rear bumper, then we move back up the convoy to our position in line, number four. From there, Renshaw pushes on. The radio bursts into life again, with the commissaire reporting that the bunch has split. Thirty or so riders have a 30-second lead, behind is another group of 40 or so, after that it’s a series of echelons. I crane my neck to look through the window of the car and up ahead I can see the echelons, groups of a dozen or so riders spread all across the road, an invisible barrier separating them from the next group. For all but the front group, the race is over. They’ve been racing for less than 20 minutes. Zabel and the mechanic, Nick, note down the numbers as they’re read out. Columbia-Highroad has four in the front group, but not Cavendish, who made contact with the back part of the peloton just as it split at the front under sustained pressure from the Cervelo team. Fortunately, there is no change of plan. I’m in. So, mindful of a previous near-disastrous journey in a team car when I thought my bladder was going to explode, I visit the lavatory for the umpteenth time this morning. Back at the car, I clear a little space and wedge myself in, then wait for Brian, Erik Zabel and Nick the mechanic to get in. The space around my feet is filled with bags containing their lunches. Damn, I forgot to bring any lunch. The arm rest has the start list taped to it, then Nick and his wheels get in and the quick release skewer from a rear wheel is wedged under my elbow. “Okay? Comfortable back there?” asks Brian. Nick shoots me a glance and suddenly I realise that I’m sitting in the space where his wheels should be, and were it not for me, he’d be stretching out in luxury. Instead, he’s packed in tightly too. As we roll towards the start line, a few riders knock on the window to say hello to Brian. These pre-race chats are always brief, full of nerves, but are a merciful few seconds in which to divert the brain away from task ahead. The wind has got up and the rain, though light, is piercing, like being pelted with handfuls of uncooked rice. “Don’t you just wish you were racing today?” Holm asks Zabel. “It’s gonna split up very early, I told the guys,” says Holm. “I hope you’re right, or you’ll have zero credibility,” replies Zabel. “They gotta be near the front, but not on the front, for the first hour,” adds the Dane. We sit and wait at the start line for a while, windows up tight to keep out the rain and the drone of the commentator. Holm fiddles with the air-conditioning, settling on an agreeable 21 degrees Celsius, then he checks the radios are working. “Okay gentlemen, can you let me know you can hear me,” he says. In quick succession the team’s eight riders call out their names. It’s working. Zabel adds another anecdote. “In the Tour of Majorca the riders don’t have to ride every day, you can sit out a stage and then come back the next day. One day we were trying to set up the sprint and we said on the radio ‘Okay Sieby [Marcel Sieberg] go to the front, wind it up, prepare the sprint for Edvald [Boasson Hagen]’. We drive out of Deinze and head out on the main road. Zabel glances at the treetops and realises the wind is coming from the right. He draws an arrow on the route map. It means the riders will have a crosswind for the first 50 kilometres, before turning into it. Crucially, there will be a long tailwind section from Koksijde until they get to the hills near Poperinge. I’d expected the instructions to be a lot more detailed, but in fact Holm never gave anything other than the sort of basic information the riders needed to make their own decisions, such as the distance to the next section of cobbles or the next hill, or the time gap. He told the riders where the team car was in relation to them, so they’d know whether to wait for him or whether to use the neutral service vehicle in the event of a mechanical problem. There was no detailed tactical plan, those strategies were left to the riders to make among themselves on the road. “Are you sure it’s not a right turn?” Zabel says. “No, it’s definitely a left,” says Holm. They disagree for a moment, but it’s light-hearted. “Hey, I rode this race two years ago, I think it’s a right turn,” says the German. A few kilometres on and we turn left onto the cobbles. Holm turns and grins at Zabel. “Well, I think there’s a right-turn coming up soon,” says the German. “Sure, Erik, I think at some point today we’re gonna do a right turn,” Holm deadpans. After a frenetic opening hour, during which the peloton was sliced to ribbons by the wind, the Columbia-Highroad car dealt with three mechanical problems and we passed group after group of riders who’d all but been eliminated, the race settled down into a pursuit between two sizeable groups. There were 30 or so riders up front, with a similar number about a minute and a half back. Tom Boonen had been the only Quick Step rider in the first group, until he punctured. “Quick Step’s gonna chase now, so gentlemen in the front group, don’t work at all in case it comes back,” says Holm. After almost an hour of chasing, Quick Step had failed to make any significant inroads as Cervelo kept the pressure on at the front. In fact, the gap is up to two minutes. Even with 130 kilometres to go, Zabel has decided the race is done. With this lull, lunch is declared. Brian takes pity on me and offers me a team issue ham and salad baguette. Then we stop to answer the call of nature, but I don’t need to go, before racing at breakneck speed to regain our position as fourth car in the convoy. Shortly after that, we hit a bump in the road and one of the bikes on the roof slips out of its clamp. The front wheel slides down over the windscreen, so we stop and Nick fixes it again. When we regain our place behind the front group there’s been a crash. Two Rabobank riders, Mat Hayman and Graeme Brown, are down, as is Bradley Wiggins of Garmin. As we inch past, there are bikes and bodies in the mud at the side of the road. Wiggins looks hurt, trapped beneath his own Felt bike and one of the Rabobank Giants. Now we’re with the front group, the Columbia riders take turns to drop back to the team car to take bottles, energy gels, a fresh, dry jacket, and have a brief chat about how things are going. We round a left-hand corner and there’s the slap of a hand on the back of the car’s boot. It’s Wiggins, letting us know he’s there, after his chase back to the leaders. At two o’clock the television coverage begins on the Belgian station Sporza. Brian turns on the television set mounted on the dashboard and tunes in. To the viewer, it looks an ordinary race. The front group now has a lead of almost four minutes, the second group containing Cavendish and Boonen is just going through the motions, with no chance to get back in contention. But all the racing happened in the first hour, when there were no cameras to witness the carnage. For Columbia-Highroad, Marcus Burghardt looks very strong as they go over the Kemmelberg for the first time. “Nice, Boogie, nice. Very nice work,” Holm says over the radio. After the climb the front group splits in two and for 20 kilometres there is a pursuit match going on. As they approach the Kemmelberg for the second time it is about to come back together when the Belorussian Aleksandr Kuschynski attacks. “This is a good move,” says Zabel. “Edvald could go with this. Kuschynski’s a good rider to be with. Super-strong but not that clever.” He means in a tactical sense. Once the gap is over a minute, we get permission from the commissaire to overtake the chasing group and settle in behind the two leaders. As we go past the group, Holm slows to have a word with Burghardt and Hincapie. He offers them each a bottle. The gap is one minute 20. Wiggins is setting the pace at the front, trying to drag it back together for his Garmin team-mate Chris Sutton. Holm can’t resist the chance to plant a seed of doubt. “Two minutes, Wiggo, two minutes,” he says mischievously before winding up the window and haring ahead to join Boasson Hagen, Kuschynski and the Liquigas team car. Holm is fidgety for the first time today. Zabel and Nick the mechanic lean forwards to watch the TV. Inside the final five kilometres, the commissaire pulls us over as three chasers, Hayman, Andreas Klier and Matt Goss try to close the gap. Under the kilometre-to-go kite and the car is silent. Holm is driving on autopilot, eyes fixed on the screen. Boasson Hagen opens up the sprint early, very early. It seems Holm and Zabel hold their breath for the final 500 metres. Then the Norwegian begins to pull clear and it’s clear he’s got it, sending the pair into raptures. The car rocks, the cheers ring out, there are high-fives all round, even for me. With that, he is interrupted by a number of journalists, all wanting to be put in the picture. They’ve seen the race on television but will struggle to understand the significance of that opening hour, when the race was lost by three-quarters of the peloton as the wind ripped across them. Holm explains how the day panned out, but it’s difficult to convey the importance of that first hour in the context of the race. The truth is that Boasson Hagen’s win owed just as much to being alert and in the right place right at the start as it did to chasing down Kuschynski later in the afternoon. The front group opened a gap, worked hard to maintain it and force the chasers into submission. The tactical point of the day was that might does not always equal right. Cervelo had almost their entire team in the first group, but lost out because the onus always fell on their shoulders. They had to do the bulk of the work to keep the group away, then had nothing left to give when the attacks started. Columbia and a couple of other teams had strength in depth without the same responsibility. As I walked away, I saw a fellow journalist. “Pretty dull race in the end, wasn’t it,” he said. “Hmmm, yeah,” I said. I wanted to explain the scale of the fight that took place in the second half of the bunch right at the start. I wanted to pay tribute to the poor souls who found themselves on the wrong side of that invisible line created by a savage wind. I wanted to describe the anguish written on the faces of those who found themselves engaged in a pointless, demoralising, almost demeaning chase right from the off. There they were, seeking a pitiful shelter in among the team cars, probably already thinking about how far they’d have to ride before it would be acceptable to stop and climb off, formulating their excuses. I wanted to explain that often there’s a lot more to a day’s racing than the bit you see on the TV. I wanted to talk about the level of trust and respect that exists between the riders and their team managers, a subtle relationship in which the manager has the experience and authority, but is also at the riders’ beck and call, fetching drinks and jackets and food, offering support, advice and understanding. I wanted to explain how reassuring Holm’s management style must be. Hands-off, yet decisive. Laid back, but professional. In management speak, they’d describe it as ‘facilitating’. He did everything he could to enable Columbia to win the bike race, without issuing orders or ultimatums, without once raising his voice or losing his calm. “I was in the Columbia team car,” I said.